I mentioned yesterday that I'm trying the so-called "Green Monsters" that are ever so popular on the blogosphere. My friend Robyn first recommended them, then a Google search turned up Oh She Glows, apparently THE source of the Green Monster. I've tried it with peanut butter, but that mostly stuck to the side and wasn't too fantastic. I've tried it with some protein powder, but need to get some more to see if it really works. It does fill me up, surprisingly, and I feel better and eat less crap, especially when I make my first snack of the day fruit and not a granola bar. My #1 tip? Mix the spinach and almond milk BEFORE you add in everything else. 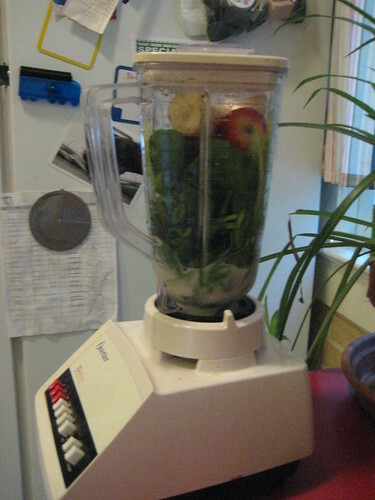 The spinach purees beautifully and you don't get gross chunks in your smoothie. Yuck!